Arrival in Leadville just 3 hours after landing in Denver, Colorado. Originally, I was registered to run the Bullet Creek 50 Miler. Unfortunately, that did not pan out as the RD for that race took our money and ran. However, that is a story for a different post, maybe another Facebook rant? Who knows. All I know is that I am actually glad that race fell through, even if it did cost me 60 bucks. 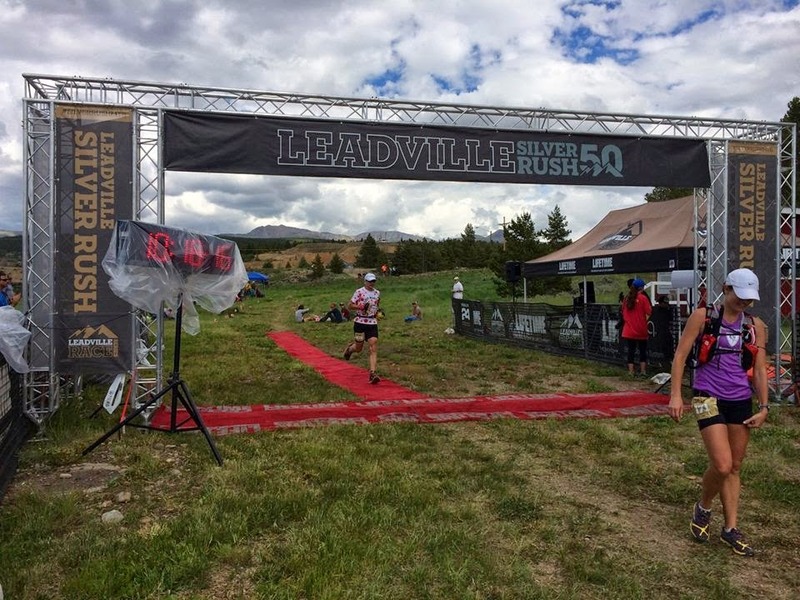 If it hand't, I would've never even considered registering for the Silver Rush 50 Miler in Leadville, Colorado. It just so happened that my entire ultra running training group from Huntsville, Alabama had planned a "mancation" (don't shoot the messenger, I didn't come up with that name) that included nine days of whitewater rafting, 14er peak climbing, ultra marathon racing and Grand Canyon double crossing fun. Everyone but me had signed on to this trip. I felt I didn't have the vacation time to burn on such a trip, no matter how much fun it would be. So once they started they trip planning, I chose to register for a local marathon during that time frame in preparation for the Pinhoti 100 Miler in November, for which I was planning a list of training races to get me ready. When said race fell through, I was struggling to find a replacement 50 miler for the month of July. I looked everywhere, ultrasignup.com, ultrarunning.com, etc. nowhere did I find a 50 miler within reasonable driving distance of my home. As I was sharing my frustration with the group during one of our early morning training runs, Jerry suggested "you can sign up for the Silver Rush 50, I think registration is still open". Nah, I thought, that's a lot of money for a flight and other stuff just to travel to Colorado for one weekend. I let it simmer for a couple of days and when I realized that I might actually have some frequent flyer miles I could use for a free ticket, I started seriously considering it. 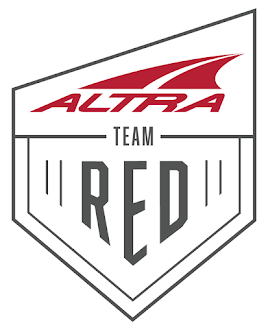 And when my training buddies graciously agreed to pick my @ss up at Denver airport and drop me off again, if needed, as well as let me crash at their room during my short stint, I had all the encouragement I needed to book a flight and register for the race. "Colorado, here I come!" I was super pumped...and then it hit me. 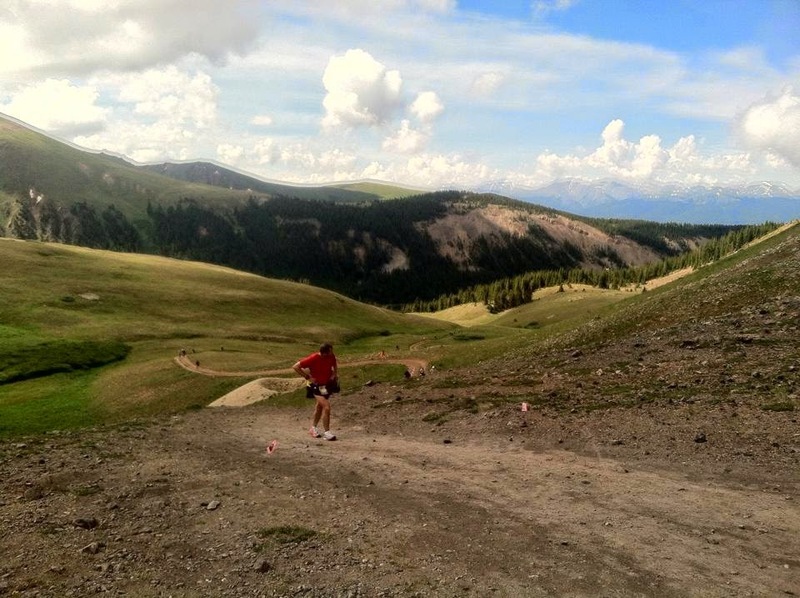 I'm going to run a race with 8,000ft of climb, ok, no big deal, but I'm doing it all between 10,000-12,000ft of altitude, now that was a big deal. I had no idea how my body would react to thin air, no matter how well trained I thought I was. 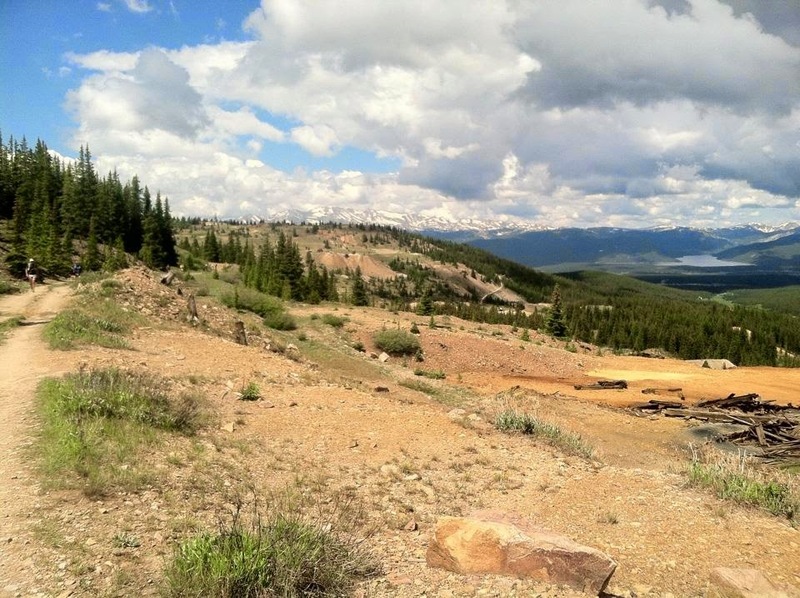 I had booked my travel in a way that I arrived in Denver and ultimately Leadville within less than 24 hours of the race start. This had been recommended to me by others with more experience in altitude racing than me. 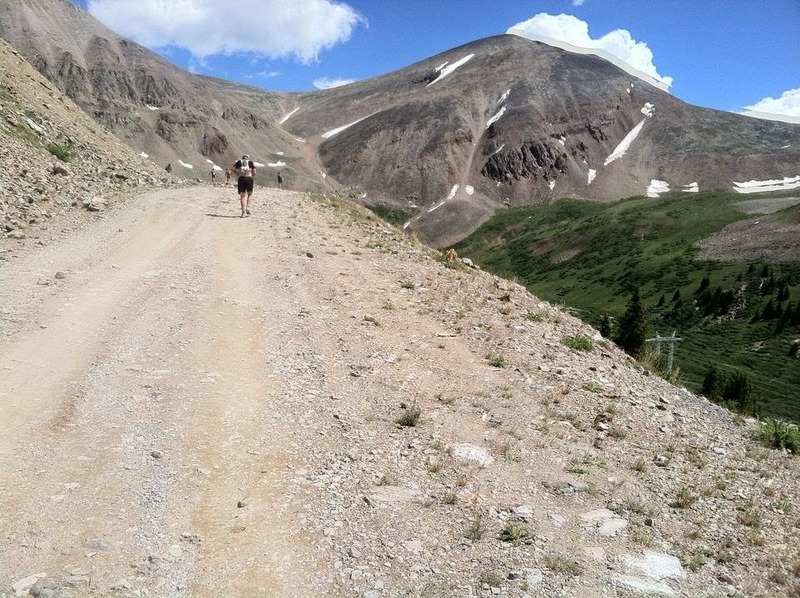 A better options would have been 2 weeks of acclimating in Colorado, but I didn't have that kind of time, so the next best option is to arrive just before the race, before your body goes through any severe changes due to the altitude. I would still suffer, but maybe not as badly as if I had arrived a day earlier. We are all an experiment of one, but I can definitely state that I absolutely made the right choice here with my late arrival time as become evident the next day. I packed extremely light for my trip, a few changes of underwear and socks and lots of racing gear all shoved in my old 30L Salomon backpack as I had no intention of checking any luggage and risking loosing running gear on my short trip. My wife drove me to the airport in the wee hours of Saturday morning and after a couple of short legs I arrived in Denver, Colorado. 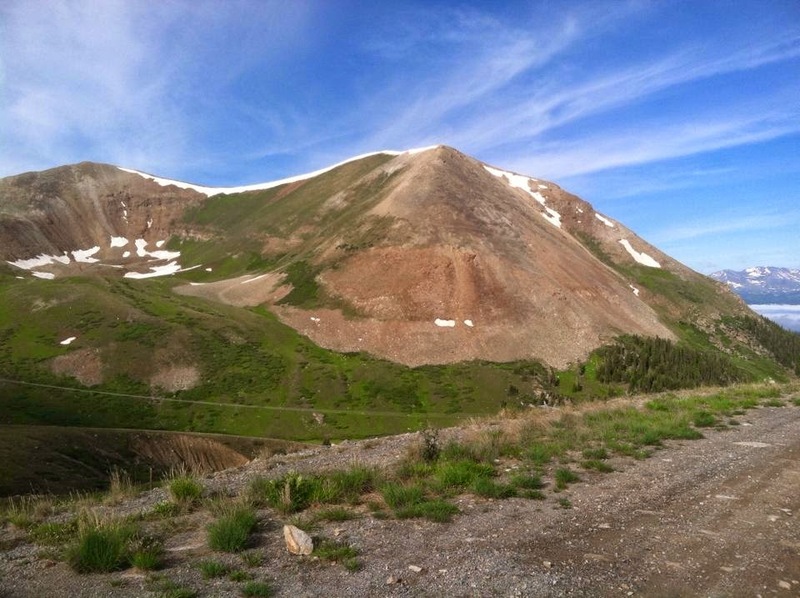 Since the trip from Leadville to Denver and back was about 4 hours, my running buddies who'd arrived 2 days earlier and who had been out hiking some peaks in order to acclimate to the altitude, decided to chip in for a shuttle that would take me to Copper Mountain, where they would pick me up. They could have just left me to my own devices, but instead took care of all of the arrangements. I am extremely lucky to have a group of friends like that! And with that, thanks again Richard, Mike, James, Jerry and Ed for hooking me up the way you did! 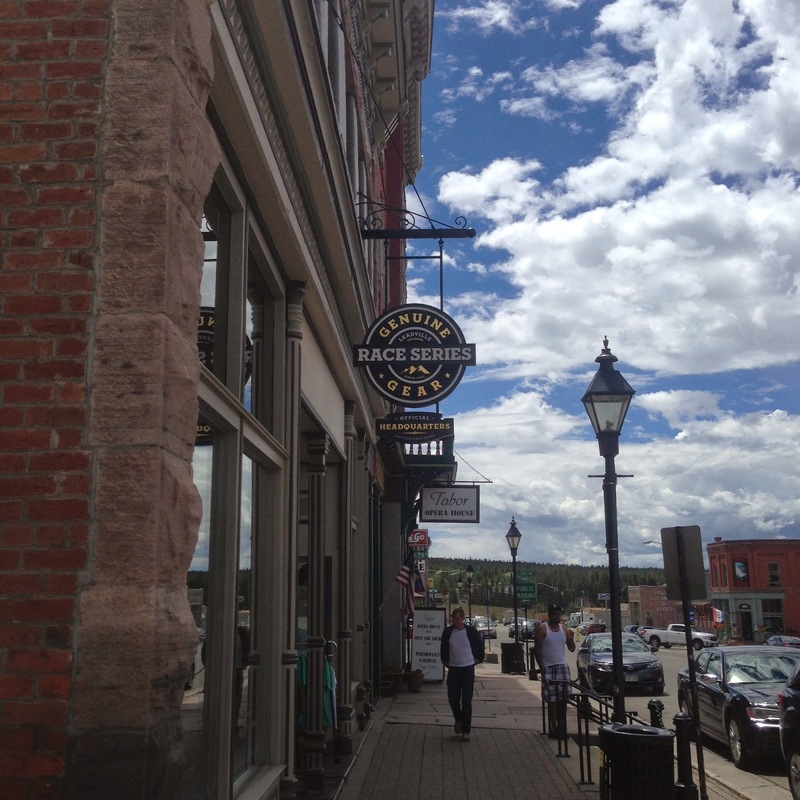 The Leadville Race Series shop, location of the packet pick-up on Saturday. Once we got back to the resort and I got to see the other guys, who'd been chillin' and resting up in the hotel, I was just giddy with excitement. I couldn't sit still. I pretty much started laying out my running gear for the next morning and when I was done, it was almost time to head out for our pre-race dinner. We opted for Chinese, which I'm still not sure was the best choice, but I don't think it hurt me too bad:-) By the time we got back to the hotel room, everyone finalized getting their running gear ready before heading to bed early. Wake up call at 3:30AM, since we had an hour drive to the race start. The whole crew just before the start of the Silver Rush 50, James, me, Ed, Rich, Mike and Jerry, respectively. 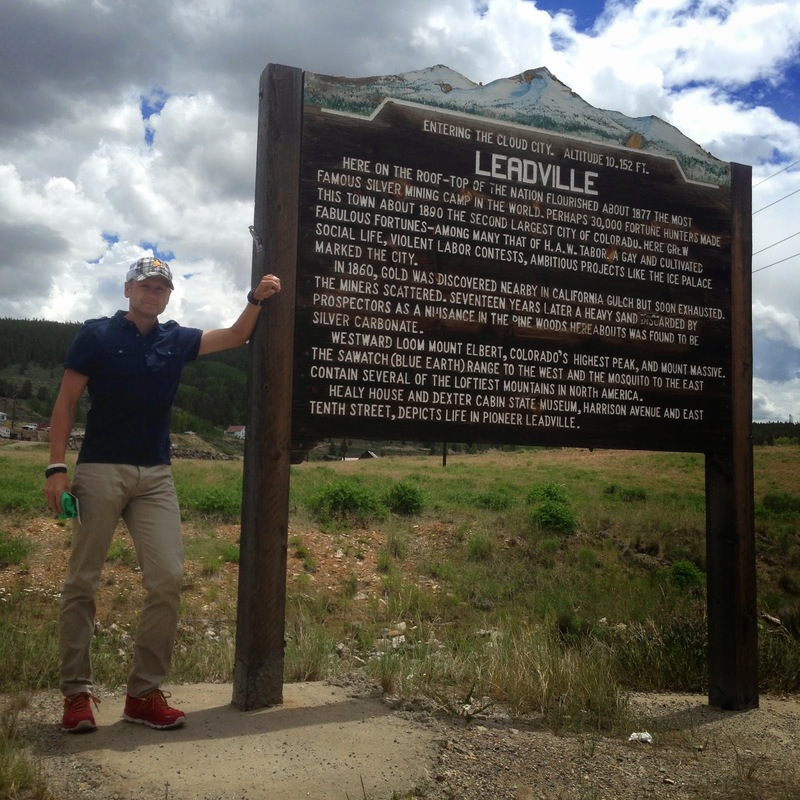 We arrived in Leadville just about an hour before the race start, plenty of time for any pitstops as well as last minute gear preparations. I opted to pack a drop bag for the turnaround point that included extra SCaps, a shirt, hat, socks, shoes and 2 hand bottles. I planned to start the race with my Ultimate Direction AK (Anton Krupicka) vest. I wore cheap sleeves at the start to address the slightly cooler than expected temps. I carried 30 SCaps, 2 packs of Honey Stinger Chews, Benadryl and my EpiPen, chap stick, body glide and my iPod Shuffle for that little bit of extra motivation for the last 10K of the race...it ALWAYS works! I wore a pair of Salomon trail running shorts along with Injinji wool socks, Altra Olympus shoes and a pair of Dirty Girl gaiters. My gear choices worked out perfectly. I expected lots of gravel like jeep roads and the gaiters saved me lots of time as I watched many runners on the side of these jeep roads digging rocks out of their shoes...not me:-) The Altra Olympus also performed perfectly. Absolutely no issues with Morton's Neuroma in my right foot and barely a couple of hot spots. Also, no blisters thanks to my sock/shoe combo. I didn't change either at the halfway point as I had originally planned. That hill behind me presents the first "stage" of the SR50. As runners were gathering at the starting line, the organizers and the founder of the event had some great advice and some inspiring words, "Dig Deep!" 'bout sums it up. We definitely had to dig deep, especially all of us flatlanders in attendance. 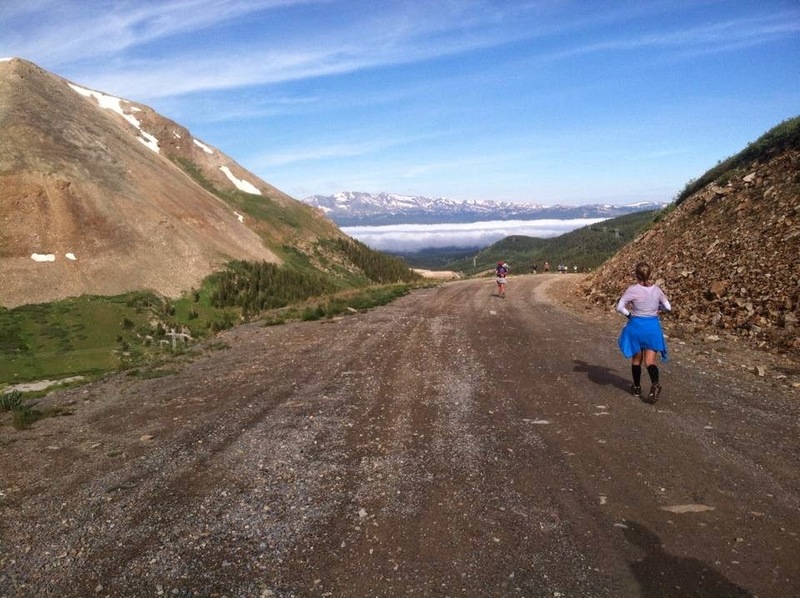 Early section (around mile 6) with clouds in the background below our altitude. The start of the race was indicated by a rifle shot. About 15 runners took off in a sprint in an effort to win one of the coveted coins awarded to the first female and male to reach the top of Dutch Henry Hill. 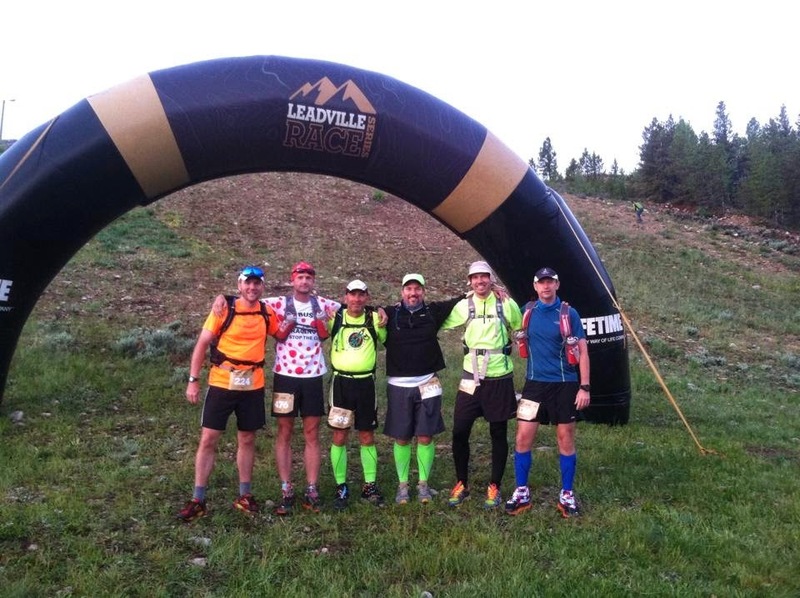 These individuals would also receive a reserved spot in the Leadville 100 Mile ultra, albeit not a free entry. When I finally reached the top of the first hill, I was already gasping for air. This would continue for the remainder of the race. Every time I'd reach the top of a hill, every time I took a swig from my bottle or took a bite of food, my body would revolt immediately after, gasping for air. Every time I did anything but take deep breaths, my body would gasp for air. Massive outbound downhill section that starts at mile 10. 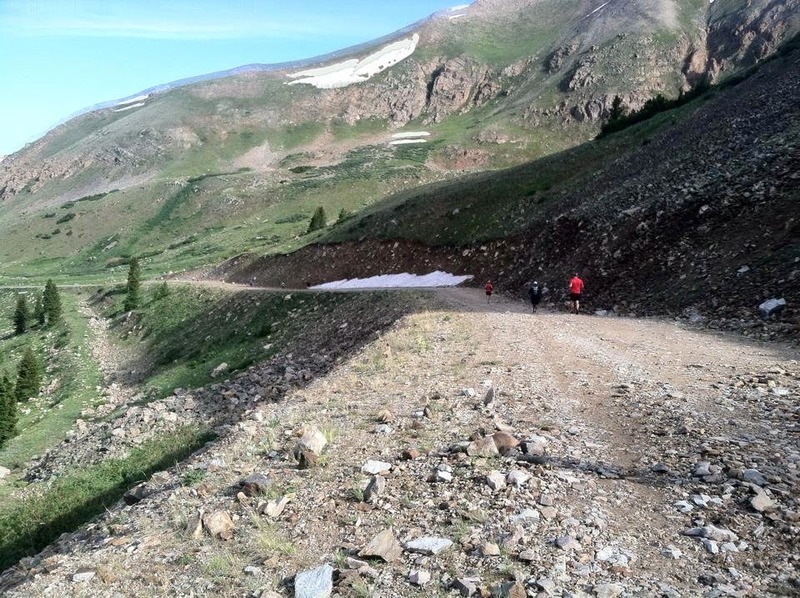 I had already mentioned tip #1 regarding arrival within 24 hours of the race start to minimize the affect of altitude on your body and blood in particular. The idea behind this approach lies in the fact that your body composition takes about 24-48 ours to be affected and changed by the altitude, first very negatively, then progressively less severe. 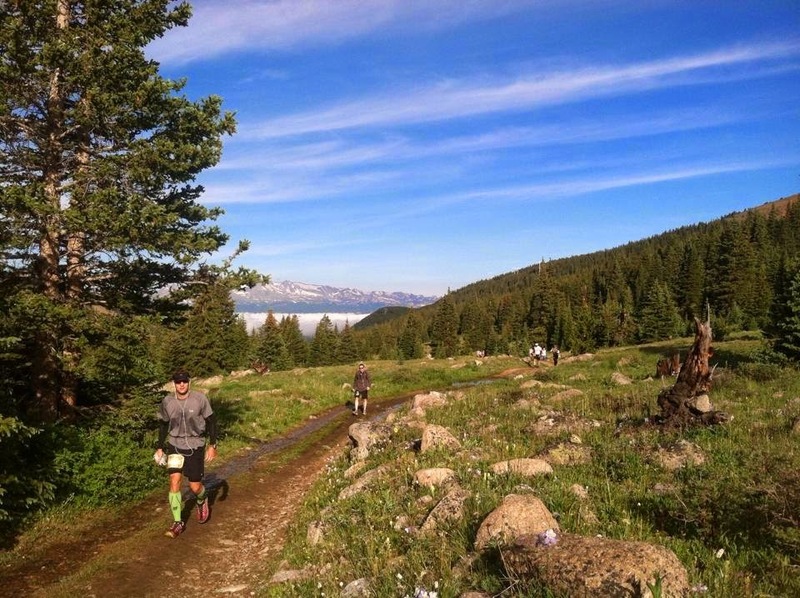 The idea being that you finish the race before your body even has a chance to change. This worked really really well for me, even if I was still seriously affected by the altitude. It could definitely have been worse. There were a couple of more pointers I was given prior to the race. First, the interwebs suggested to start taking baby aspirin 1-2 weeks prior to arrival at altitude. No problem there as I was already on a daily regimen of 81mm of aspirin. Second, it was clear that even more than usual I would have to stay on top of and seriously hydrate prior to and during the race and stay on top of my sodium levels as well to try to keep the altitude affect at a minimum. Overlooking the first and last 10 miles of the course. As soon as we crested the top of Dutch Henry Hill I lost sight of Ed, who charged ahead. I figured we'd catch him soon enough. After all, he surely will struggle for air just like the rest of us or so I thought. I didn't see him again until the turnaround point. Jerry was right next to me with Mike, James and Richard somewhere behind us. Jerry and I had talked quite a bit about the proper pacing strategy for the first half of the race, how to handle climbs and how to handle descents and flats. We pretty much stuck to our strategy of speed hiking the hills and running the flats and downhills whenever we could. Sometimes we even had to walk the flats to catch our breath. Jerry and I went through the first aid station "Black Cloud" at mile 7 and I grabbed a piece of banana and was ready to move on right after the volunteers refilled both of my bottles. Jerry and I pretty much stayed together for the first 8-9 miles. At that point and on a climb I started to slightly pull ahead while in conversation with a fellow runner. I figured Jerry would catch up to me at the top of the hill, so I continued on at my own pace. More downhill between mile 10-15. I completed the first 10 miles feeling both out of breath and accomplished. 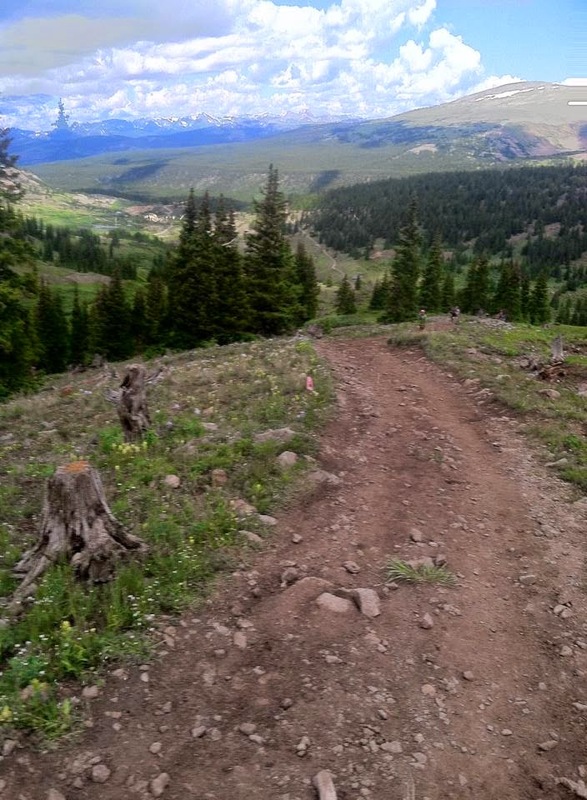 I had just finished the first of the 4 major climbs of the race, cresting just above 12,000ft for the first time. While the elevation profile showed this first 10 mile section as all uphill, there really were quite a few flat and even downhill sections. One down, three to go. As soon as we crested the 10 mile point the downhill section began and people started to really run, including me. 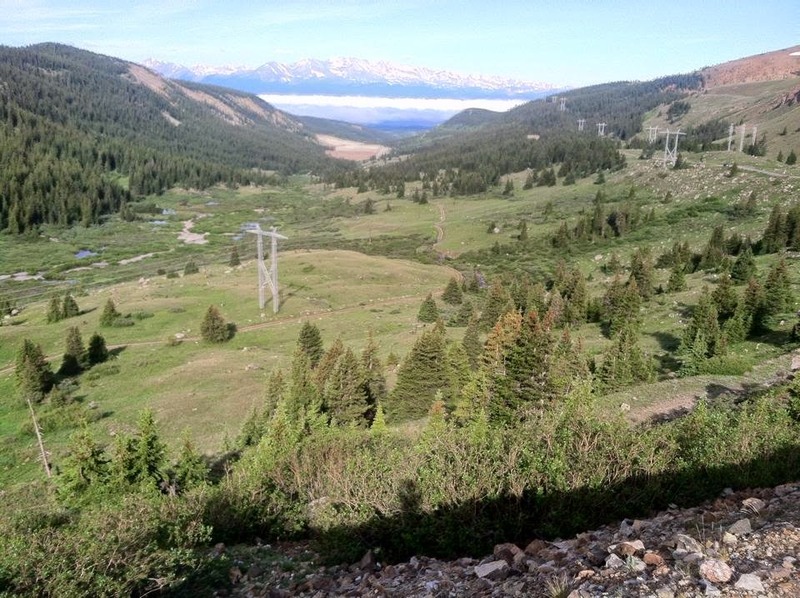 As soon as I started to descend down to a lower elevation, I started to feel better. Just past the half marathon mark I arrived at the "Printer Boy" aid station still feeling pretty good. My overall pace was exactly what I was hoping for, but I was still on track. Yet more downhill to reach mile 15. At this point I had pretty much been running by myself since losing sight of Jerry behind me. The field f runner had stretched significantly, really allowing me to run my own race without being sucked into someone else's or feeling stuck behind other runners. I continued with my racing strategy of speed hiking the hills and running everything else. The running terrain was not very technical with a few exceptions, so it did allow for some good running when we weren't climbing. 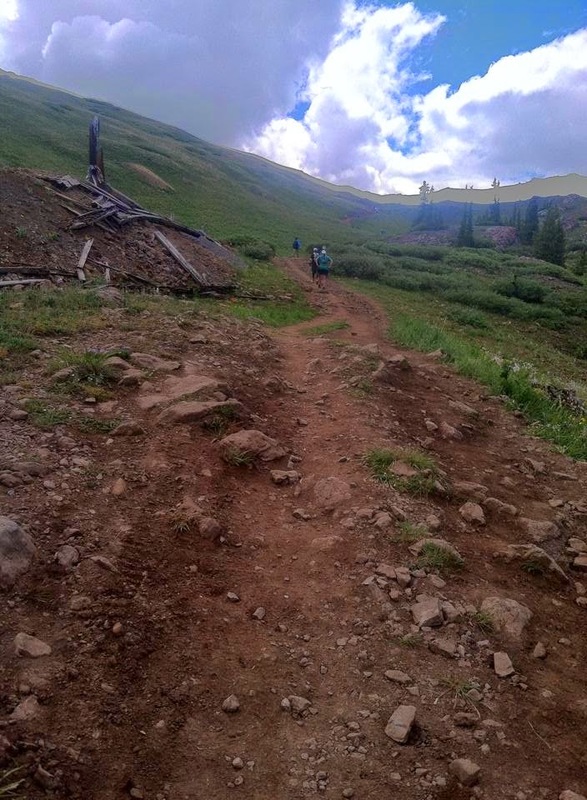 After a sharp and steep descend out of Printer Boy aid station, we started our second major climb of the race and this one was stepper than the first again making it impossible to even attempt to run. I continued my slow progress on the climbs, staying hydrated and gasping for air after every sip. 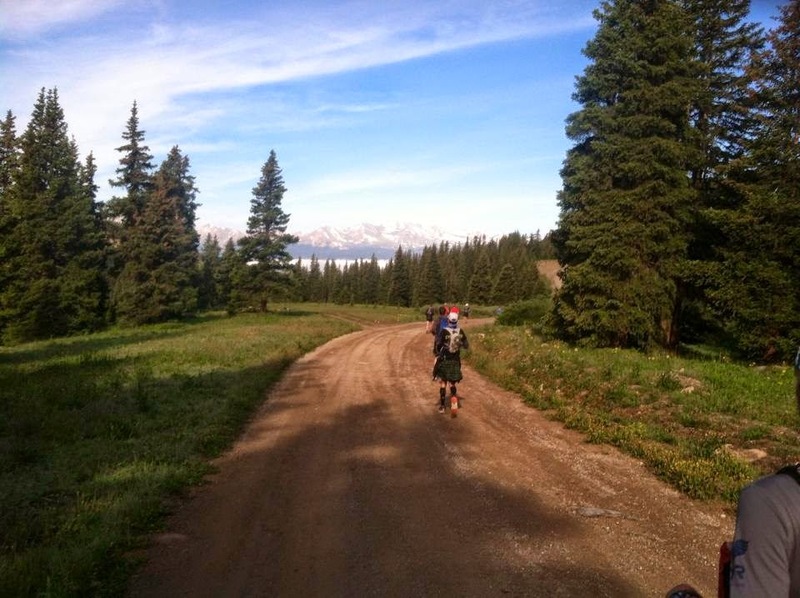 I had been drinking 1 1/2 to 2 bottles of Gu Brew (aid station drink) between every aid station in order to make sure that I would go into a deficit. Still, the altitude made my fingers and hands swell like never before. I mean, there were bigger than super-sized Ballpark Frankfurters. I got used to it, they would swell on the ascends and kinda go halfway back to normal on the descends. I would only eat pieces of banana and orange slices and the occasional tortilla with turkey and cheese, but my main source of energy were my fluids. One of the gnarlier climbs. I knew from checking out the elevation profile that we would crest the second major peak where we would find the "Rock Garden" aid station around mile 18 before dropping down briefly before heading right back up again prior to descending down to the halfway point and the Stumptown aid station. I arrived at the aid station at mile 18 feeling very good. The views atop the mountain were absolutely breathtaking, both figuratively and literally. I refueled with the usual fare and continued on, eager to get to the downhill section that would lead to the turnaround point. I made it down and up again over that aforementioned second mini climb before starting the big descent to the halfway point. This was actually the only low point in my race. This section, while mostly downhill, felt like it went on forever. Amazing view from the trail. 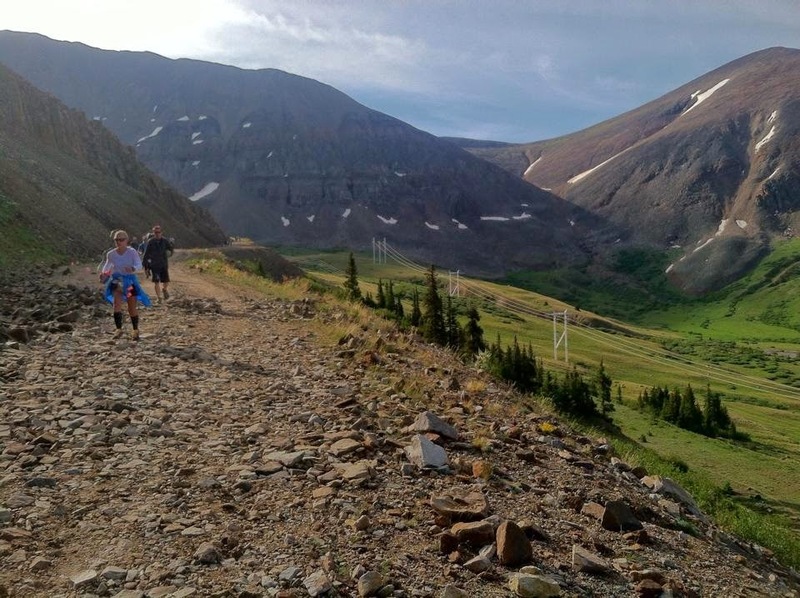 It did not help that you could see runners for miles ahead running below you on trails that snaked their way around the mountain and through a valley. It felt like I would never get there, but when I finally got close and started to see the crowds of spectators, my spirits were immediately lifted. I was ready to get some food, change from my vest to hand bottles and get the second half of the race going. 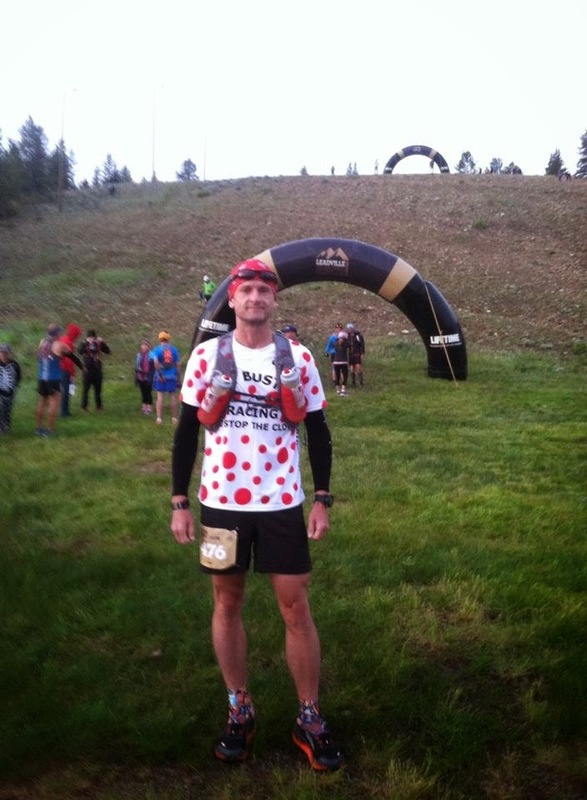 As I was making my way through the aid station for what felt like a penalty loop straight up a short but steep section before running through the timing station, I finally saw Ed, who was just coming out of a portapotty before getting his drop back to change gear. He had arrived a few minutes before me and he was looking strong. It is on, I thought! I wasn't planning to change gear other than take my hand bottles out of my drop bag, so while Ed was still changing clothes, I was off again. A little friendly competition never hurt anyone:-) However, the way he looked, I wasn't sure I would be able to stay ahead of him. 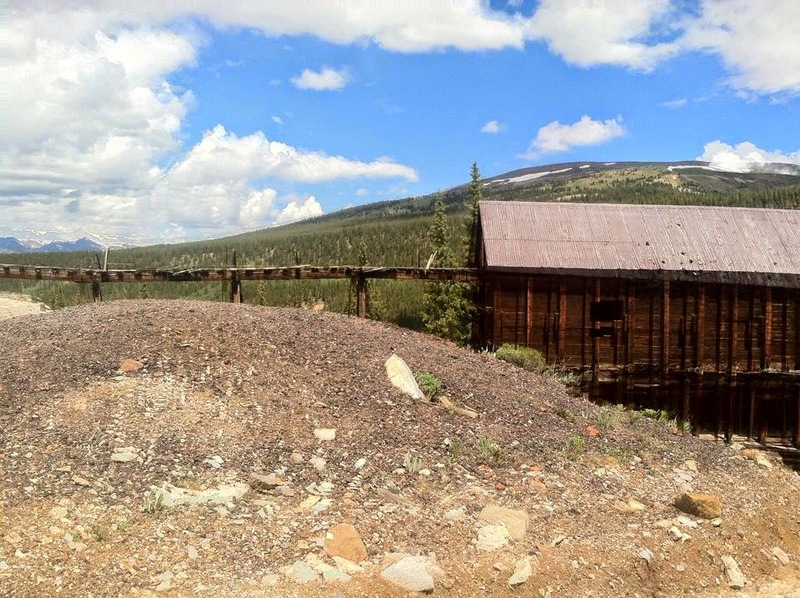 An old abandoned saw mill? This next section was probably the most fun during the race, I was chatting with some fellow runners that just came out of the aid station, spectators were calling me "King of the Mountain!" and I finally got to see the rest of our crew, Jerry, James and Mike, respectively, as they made their way to the turnaround aid station at "Stumptown". I wouldn't see Richard until I got back to "Rock Garden" at mile 30, but more about that later. View looking back at the biggest climb coming back from the turnaround point, somewhere around mile 29ish. 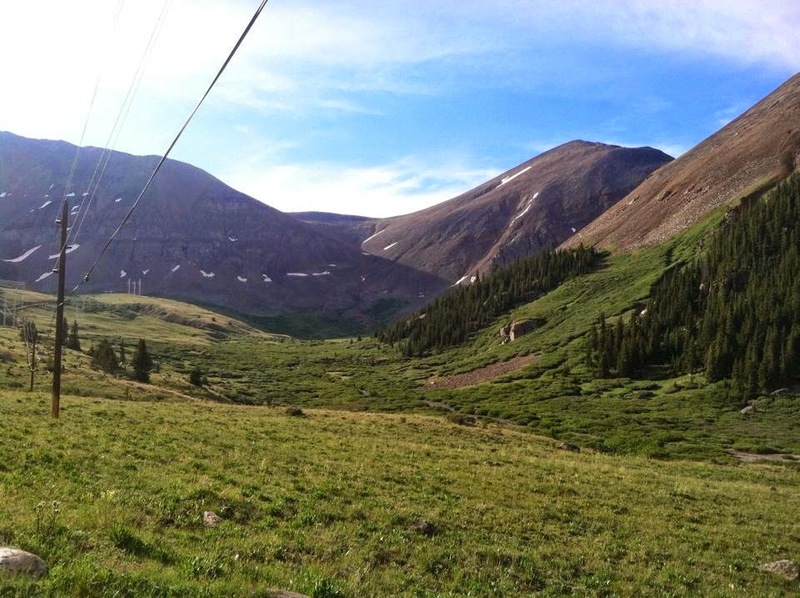 Coming out of the halfway aid station, I was feeling reenergized. I knew I had one really steep climb to go before I could try to start pushing the pace a little. This section actually had some snow on the trail on the top that had turned into mud by the time I made my way back. This section was pretty steep and technical, but I was feeling great. I was passing fellow runners, but all of us really had been reduced to "hikers" during this section of the trail. There was an unmanned water station along this section as well and while I made sure that the runner ahead of me didn't forget his sunglasses as he left, I myself managed to leave both of my water bottles when I turned to take off. Thankfully, the volunteer standing by the water station reminded me that it would probably not be a good idea to leave my bottles, duh!!! This race has some serious climbs. I continued my climb, wondering where Richard was. I hadn't put in quite the training required for a race of this magnitude, but he had accepted that fact prior to the race with a goal of making it as far as possible before hitting a local bar to grab some beers and catch the World Cup finals:-) When I finally arrived back at the Rock Garden aid station, there he was hanging out at the aid station, cheering me on and helping me as I made my way to the aid station table. I was feeling a little rough at this point and gladly accepted some watermelon with lots of table salt on it. This last climb was rough, but I also knew that I only had one more serious climb to go before it was all downhill to the finish. 5 miles of uphill on the way back. I could see in Richard's face that he was concerned about my current state, but I was ready to get going again. I knew it would only get easier from here or so I told myself. I headed out of the aid station after 2 or 3 minutes, the longest time I spend in any of the aid stations, but I needed this short break both mentally and physically. It was great to be able to chat with Rich for a minute before moving on. Some of this next descent was very runnable, but there were some pretty steep sections as well. It was in this section that I passed quite a few people prior to the final 5 mile climb. I had come through the halfway point 175th out of 400 runners, not quite what I had hoped for, but I was steadily making up ground, I just wasn't sure how much. I went through Printer Boy grabbing some bug spray from one of the volunteers before refueling and moving on. I was ready to get the final 5 mile climb over with so I could push the final 10 miles to the finish. this final climb went on f...o...r...e...v...e...r.
During that final stretch, I caught up with another runner who somehow happened to have grown up in Germany, so we started chatting in German for a while. I was definitely more tired than him, so I just tried to hold on while we both started to run a little harder in an effort to giterdun. I wasn't sure of the exact mileage as my GPS watch can be off quite a bit during trail races, but I knew I could actually finish somewhat close to my A goal, even with all of that walking that I had done. My new buddy soon left me behind and finished a minute ahead of me (Josef Hoelscher, look me up if you're out there, I enjoyed our chat). When I finally crossed the finish line, the clock read 10 hours 18 minutes, finishing 124th overall after passing 50 runners over the second half of the race. I couldn't have been happier and yes, I got a little emotional which I was able to hide thanks to my sunglasses. Richard was right there waiting with a chair and anything else I might need. I wasn't alone at the finish for long. Ed came in just 12 minutes behind me and Jerry, James and Mike all had strong finishes as well, making it well below the 14 hour cutoff. These guys managed to do that even after hiking a couple of 14ers just a day earlier. 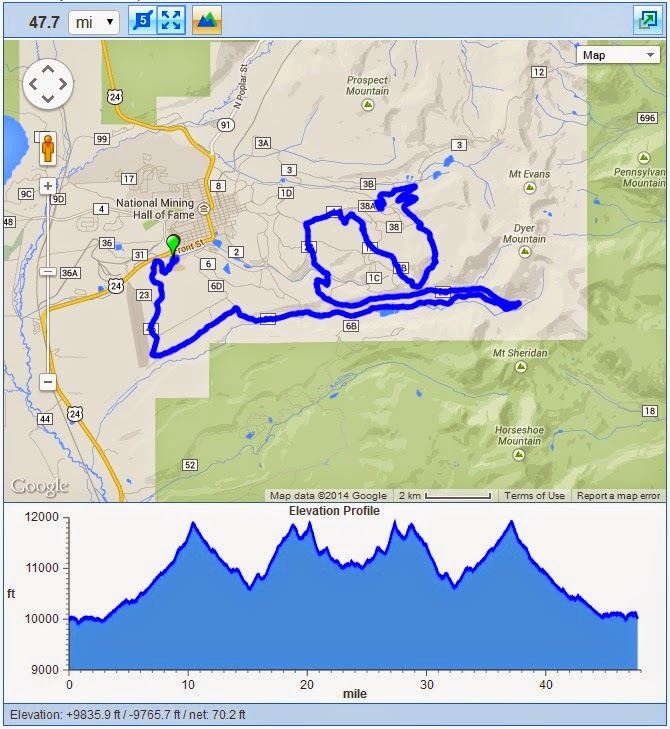 What a fun elevation profile. This race and short weekend trip was definitely one to remember for the rest of my life. To top it all off, I got to hike four 14,000ft peaks with my buddies the day after the race before catching a redeye flight a few hours later. An amazing experience with lots of pictures and videos.